Apologetics, by definition, is an attempt to give an answer for the faith, supplying reason for our existential hope in Christ and his gospel. But in the postmodern—and increasingly post-Christian—West, our accepted apologetic method may need updating. How do you make an explanation to those unpersuaded by reason? How do you supply an answer to a skeptic, to those who already “know” the standard Christian answers and don’t accept them? 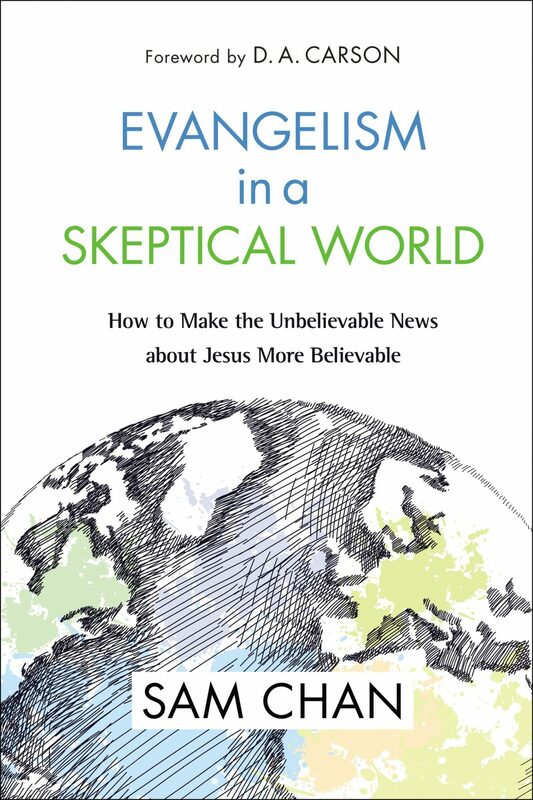 Sam Chan addresses these and other questions in his new book, Evangelism in a Skeptical World: How to Make the Unbelievable News about Jesus More Believable. Chan—a physician, theologian, and evangelist—accurately diagnoses our current cultural milieu and offers concrete examples for practicing winsome and persuasive apologetics with our questioning neighbors. Chan opens by defining the gospel and evangelism, presenting a theological foundation for the remainder of the book. Subsequent chapters address everyday evangelism and proposals for crafting gospel presentations or talks, including issues of contextualization and the (re)emerging prominence of story in our culture. Chapters 4 and 10 represent the nervous system of Chan’s work, where he keenly observes the environment into which we take the good news. Here he supplies an accurate diagnosis of our skeptical friends and neighbors and the causes (humanly speaking) that most influence belief and unbelief. First, he addresses plausibility structures, the “accepted beliefs, convictions, and understandings that either green-light truth claims as plausible or red-light them as implausible” (41). They’re the invisible scaffolding that support all human belief. According to Chan, there are three main sources for these plausibility structures: community, experience, and evidence. Where the modern, Enlightenment-minded thinker might assume evidence to be the ultimate determining factor for believability, and some of us might like to assume we only accept claims with adequate factual support, Chan shows that the other sources can be just as compelling. We tend to accept the claims of those we trust, especially when we witness those truths lived out in a compelling community. Zondervan (2018). 288 pp. $24.99. Most Christians already know that they should be telling their friends about Jesus. But they have been poorly equipped with methods that are no longer effective in today’s post-Christian world. As a result, many people become frustrated, blame themselves, and simply give up. Evangelism in a Skeptical World is a textbook on evangelism for the church or the classroom to equip Christians with the principles and skills they need to tell the unbelievable news about Jesus to friends in a skeptical world. Postmodernity, as he explains, places higher value on community and experience. Purely evidentialist argumentation, such as trying to prove the resurrection, won’t carry much weight in contemporary evangelism. Instead, in a skeptical world we find that “hospitality breaks down plausibility structures” because it witnesses to truth in the context of community and an experience of love (117). Chan also helps us consider common “defeater beliefs” that make it practically impossible for someone to come to Christ (241). Here again he shows the integral role of community in shaping all of our beliefs. In fact, many commonly-accepted truths may be empirically unverifiable, but we assume them based on shared understanding. Thus, addressing an individual’s defeater beliefs merely with raw data—to simply quote John 3:16, for example—isn’t likely to result in conversion. As a doctor, Chan notes the increasing openness to alternative medicine in our day and a growing distrust of naturalism or hard science. This fits with his observation that society is now more trusting of a person with a positive experience (with, for example, essential oils or acupuncture) over raw data. In a way, then, Chan proposes his own version of alternative medicine, a fresh way of going about our evangelism. He’s not arguing for abandoning the gospel, but contextualizing it to people more apt to believe the message if it comes within the context of vibrant community and persuasive experience. Here Chan combines the evangelistic importance of both message and method, words and walk, communication and community. He suggests we look for new ways to merge our universes, of bringing our lives more and more into contact with unbelievers. He asks us to move beyond solely individualistic gospel proclamation to community involvement and interaction, “to change our lives so that we live an evangelistic lifestyle, not a life with add-on bits of evangelism” (45). Some will likely chafe at Chan’s approach, labeling it as friendship evangelism or accusing him of over-contextualization. To be sure, I have my own quibbles with various parts of the book, including his view of infant faith, his definition of iniquity, or a strange and repeated suggestion that prospective ministers study creative arts instead of attending seminary. But looking past those, I do find many of his prescriptions insightful. He rightly doesn’t pit natural human means against the ultimate and supernatural agency of the Spirit (253). Nevertheless, his aim is clearly practical. He wants us to think seriously about biblical contextualization, about making the claims of Christ understandable and acceptable to a world increasingly hostile to the gospel. Chan also advocates for listening to our opponents. Learning from them. Living with them. He shows how to resonate with their ideas and their concerns without capitulating to them. He models how to winsomely dismantle oppositional beliefs and assumptions, and then present a gospel that magnifies the lordship and love of Christ. That said, I did find some significant deficiencies in the book. While the diagnosis was clear, some of the proposed applications could lead to negative side effects. For instance, Chan appears to argue for delaying evangelism for the sake of relational credibility (49). This doesn’t seem like a new approach at all, but an oft-repeated mistake typical of our evangelistic efforts. The tone of the book is also non-combative. Chan emphasizes reasoning and relationships over proclamation. His approach to contextualization seems as much about making the gospel palatable as understandable. In Chan’s argument for finding common ground with our skeptical audiences by referencing contextualization in the apostolic witness in Acts (67), there is a conspicuous lack of emphasis on judgment or repentance. But in Acts, repentance is a command, not a suggestion. One has to wonder if the evangelistic speech act envisioned by Chan would ever communicate such authority and urgency. The gospel isn’t merely that “Jesus is the answer to my deepest longings” (59) or that Christianity, as it turns out, is a good fit with my pre-existent cultural assumptions or community values, but, as Chan admits, that Jesus is Lord (24). The gospel, then, is by nature offensive and alien. It’s a call to renounce self and turn away from the world. Chan’s suggestions for giving an answer for our hope in Christ to a skeptical world is persuasive in many ways. His approach, perhaps more apologetic than evangelistic, is engaging and no doubt effective, a much-needed corrective to old habits and unhealthy practices. My prayer is that the church will implement his vision insofar as it helps us communicate the gospel more accurately and relevantly, doing so in a community that’s compelling both for its love and truth. Elliot Clark (MDiv, The Southern Baptist Theological Seminary) lived in Central Asia, where he served as a cross-cultural church planter along with his wife and children. He is currently working to train local church leaders overseas with Training Leaders International. And he is the author of Evangelism as Exiles: Life on Mission as Strangers in Our Land (TGC).